One of the wonderful things about the holiday season is the chance to enjoy the natural aromas of a fresh Christmas tree in your house. Whether you buy a tree pre cut at a local retailer, or go with your family to a nearby Christmas tree farm to choose and cut your tree, or cut a tree you’ve grown yourself, getting a fresh natural Christmas tree is one of most pleasant family rituals of the holiday season. About 400 farms around Massachusetts grow Christmas trees, primarily for retail sale during the 5 week season between Thanksgiving and Christmas. Christmas tree sales add about $1.4 million to the Massachusetts economy, according to the Massachusetts Department of Agricultural Resources. Trees take between 7 and 12 years to grow to maturity here, so trees being harvested this year were planted between 2006 and 2011. To ensure a sustainable harvest, growers need to replace trees harvested each year with new seedlings. Principle species of trees that are grown on Massachusetts Christmas tree farms include the Firs (Balsam, Fraser, Concolor and Douglas), the Pines (Scotch and White), and the Spruces (White and Blue). Trees are retailed in a variety of methods, including choose and cut at local farms, freshly cut, and balled and burlap. Sizes vary. Costs for a natural tree run between $25 and $100 depending upon size and other factors. Before you head out to get your tree, you should determine how tall and how wide a tree will fit where you plan to put it – trees always look smaller outside on the stump or the lot than they do when you are trying to get them in your house. Measure the height of the space you plan to put the tree and then subtract the height of the tree stand and the length of whatever ornament you plan to top the tree width. Then measure how wide a tree will comfortably fit in your space. Once you have those measurements you can go out to find your tree. 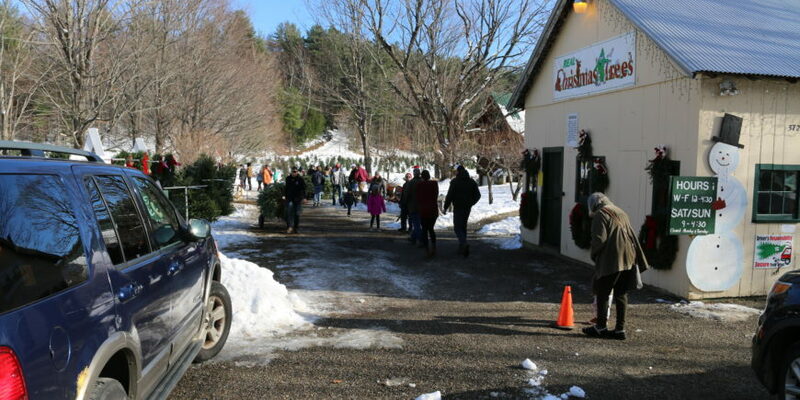 For a list of Christmas tree growers in your area, go to the Massachusetts Christmas Tree Association website at www.christmas-trees.org to find a Christmas tree farm near you. The website also has some excellent instructions on how to care for your tree once you bring it home to keep the needles fresh and keep the tree from drying out. You should plan to check and water your tree every day it is up to keep it fresh and reduce the chance of fire. Have fun getting and decorating your tree, and have a wonderful holiday season!